The city by the bay is starting to be a regular stop on the StarTalk Live! tour. This year will mark the third year in a row that we’ve headed out to San Francisco to take part in SF Sketchfest. Last year, guest host Bill Nye the Science Guy and co-host Eugene Mirman welcomed Dr. Yvonne Pendleton, Director of SSERVI, former “Mars Czar” Dr. G. Scott Hubbard, Sentinel Mission program architect, and comedian H. Jon Benjamin, Eugene’s partner in crime on Bob’s Burgers. You can listen to the podcast from that show here. From Left: H Jon Benjamin, Eugene Mirman, Dr. G Scott Hubbard, Dr. Yvonne Pendleton, and Bill Nye. Credit: Jakub Mosur. 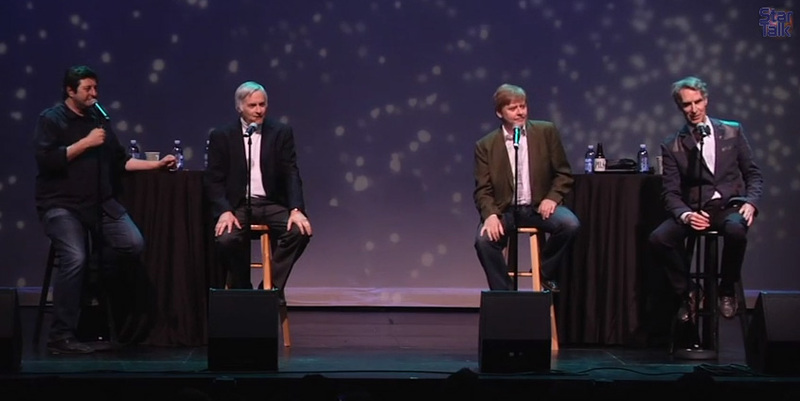 The year before that, Bill and Eugene were joined on stage by Seth Shostak, Senior Astronomer at the SETI Institute and comedian Dave Foley. You can catch up on the podcast from that evening’s show here. From Left: Eugene Mirman, Seth Shostak, Dave Foley, Bill Nye. And while we’re not yet at liberty to announce our guests at the 15th Annual SF Sketchfest on January 22, 2016 at 7:30 pm PST at the Nourse Theater, we can tell you this much: it’s a show you’re not going to want to miss. Speaking of missing out, we’ve got a very short fan presale window this time around: 48 hours. We announced the show yesterday on social media, and the fan presale ends tomorrow at 1pm ET when tickets go on sale to the general public. You can get your tickets here. Password: cosmic.